It's only pre-season - so much negative press about Chelsea -Trust in Antonio Conte. Chelsea have come under scrutiny these past couple of days over our poor pre-season performances against Bayern Munich followed by Inter Milan and our apparent lack of transfer activity. The headline states, "Chelsea are repeating their mistakes from 2 years ago — Antonio Conte sees it from a mile off" written by Darren Lewis in The Mirror and aimed at causing concern amongst the Chelsea faithful. If you read comments around the different Websites, Blogs and Forums that are out there, most are commented on by people who have either never seen Chelsea play in person in their lives or have joined the glory-boy brigade, supporting Chelsea since 2004 etc. In my view there is no need to panic. 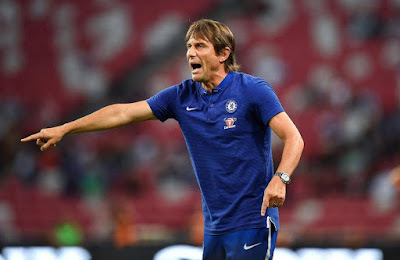 I agree that the performances were not good in our last two games but let's put things into perspective here, Chelsea played three games in eight days in the heat and humidity of the Far East in addition to two training sessions a day as Antonio Conte works his players in peak physical fitness. Are we bothered about games aimed at getting players fit in pre-season or about the games that matter and making sure that the players are ready? I personally would have liked to have seen us play the way we finished the season and built on our impressive display against Arsenal. It didn't happen because of the factors I have already mentioned and the players looked tired. Let's not forget that Antonio Conte lost Pedro as an option for pre-season having already lost Eden Hazard and Tiemoue Bakayoko through injury, all first team starters next season. So to the claim also made by Lewis stating that the Chelsea board are making the same mistakes as two years ago when we missed out on John Stones for example under Mourinho. He claims that back then, the squad wasn't big enough or prepared and the board had not acted quick enough to sign the players the manager wanted and missed out. He refers this summer to Romelu Lukaku and Kyle Walker who have moved to Manchester United and Manchester City. However, for me, the signings made by ourselves so far have strengthened the options available in the squad with talk of Chelsea being considerably close to making another two or three signings. The fact of the matter is that Antonio Conte will not stand for any signs of a repeat of two years ago. He has been backed with four new players who will all push for a first team place instantly (apart from Caballero in goal) which is good, he will ensure the players are as fit as possible and let's face it, when everyone is fit, we are still right up there with the best there is to offer in the Premier League. The sooner that Diego Costa and Nemanja Matic leave the club the better, two players who have turned down new Chelsea contracts and refused to commit to Conte. As we prepare to face Arsenal this weekend, Chelsea fans need to take a step back and look at the bigger picture here. It's only pre-season and it's about getting match fit as quickly as possible. I don't care about the results against Bayern Munich and Inter Milan or how those goals were scored because it was obvious the manager was looking at a couple of different formations. When it comes to this weekend and the new season, Chelsea fans will not have anything to worry about. Ignore the negative press and trust in Antonio Conte.